ONLINE REGISTRATION IS CLOSED, BUT YOU CAN STILL REGISTER! WE ARE ACCEPTING WALKUP REGISTRATION BEGINNING AT 430PM AT THE START OF THE RACE. 1K STARTS AT 530PM, 5K STARTS AT 6PM. WE ACCEPT CASH, CHECK OR CHARGE. 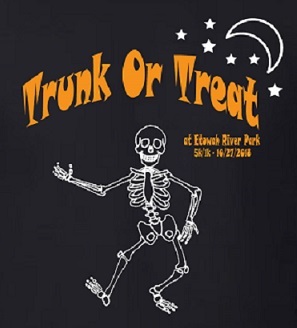 ALL 5K and 1K PARTICIPANTS WILL RECEIVE A SHIRT (WITH GLOW IN THE DARK SKELETON! ), AND GLOW IN THE DARK FINISHER MEDAL! IN ADDITION TO THE COSTUME AWARDS, WE WILL GIVE AWARDS TO THE OVERALL MALE AND FEMALE, AS WELL AS THE TOP 3 M/F IN AGE GROUPS FROM 10 AND UNDER TO 60 AND OVER! Advanced Manual Therapies, LLC is a local, family-owned practice by a Doctor of Physical Therapy and Licensed Massage Therapist who offer specialized 1 on 1 treatment sessions with every visit. Dr. Grant Smith specializes in manual therapies including Dry Needling, Cupping, and Manipulation to treat anything from Chronic Pain to Sports injuries, and everything in between. Lauren Yerkey is a neuromuscular massage therapist who specializes in Sports Massage, Cupping, and PNF Stretching to help with chronic pain or provide therapeutic massage for relaxation. They were both born and raised in the Alpharetta area and are committed to giving back to their community by providing exceptional care to those who need it. There is plenty of FREE parking ar Etowah River Park!